Alé Frederico is Senior Relationship Manager, Vice President, Westchester NY, Commercial Banking at TD Bank. In this role, she provides customized banking solutions for commercial, municipal, small business, education and not-for-profit institutions in New York. Alé joined TD Bank in 2005 and has 25 years of banking experience working in varied capacities with public sector customers, not-for-profits, commercial, small businesses and CRA/community development. She has held various roles within TD Bank as a Senior Vice President – Team Leader, Government Banking and Business Development Officer. She has been a recipient of TD Bank’s CEO WOW! Leadership Award. 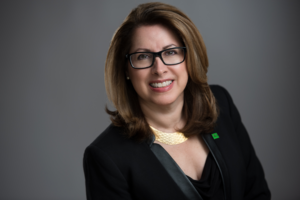 Alé is Chair of TD Bank’s Regional Diversity Council for Metro New York. She has been an active and passionate champion of diversity and inclusion and the development of emerging leaders from all walks of life and backgrounds. Appointed by New York State Governor Andrew Cuomo she serves on the Mid-Hudson Regional Economic Development Council and is a Board member of the Westchester County Industrial Development Agency (IDA). She is the Corporate Secretary of the Westchester County Association. Ale’ is a Board Member of White Plains Hospital Center and a Westchester Community College Foundation Board of Director. She is Chair and a past President of the Westchester Hispanic Chamber of Commerce, and a founding Board Member of 100 Hispanic Women Leaders – Westchester Chapter. She is a Board member of the United Way of Westchester & Putnam and a member of the United Way’s Women’s Leadership Council. She was born in Placetas, Las Villas, Cuba.